It's here! 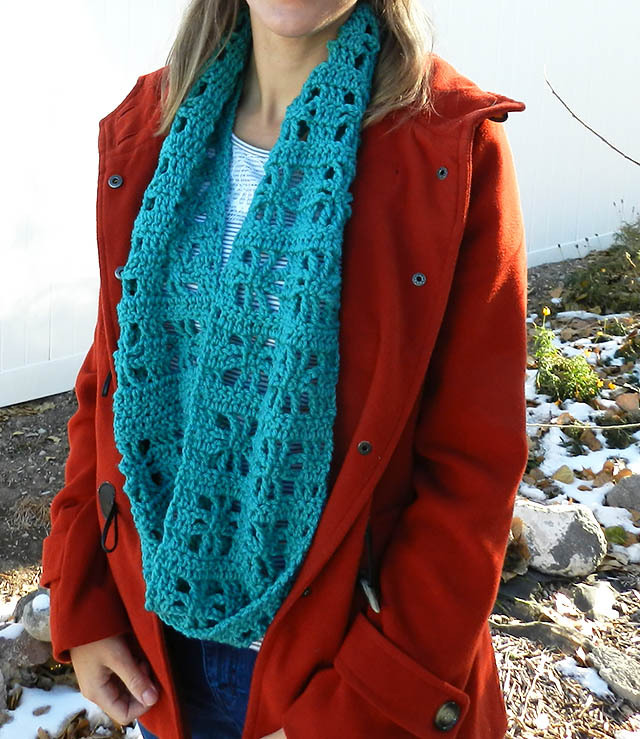 The pattern for my new crochet infinity scarf is here! This was finished over a month ago, as I wrote before, so I'm glad I finally have the pattern all written out and ready for you all! Just keep reading, or click the link below to download a pdf file. 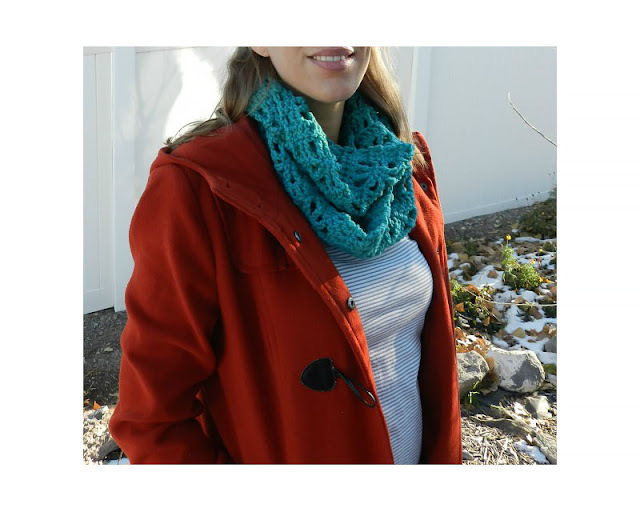 Notes: To adjust the width of this scarf, make the beginning chain a multiple of 8, plus 5. Row 1: 3 ch (counts as 1 dc), 1 dc into each of next 2 dc, * 3 ch, (skip 1 dc, 1 tr into next dc) twice, 3 ch, skip 1 dc, 1 dc into each of next 3 dc; repeat from * to end. Turn. Row 2: 3 ch (counts as 1 dc), 1 dc into each of next 2dc, * 3 ch, 1 sc into each of next 2 tr, 3 ch, 1 dc into each of next 3 dc; repeat from * to end, working last dc into 3rd of 3 ch. Turn. Row 3: 3 ch (counts as 1 dc), 1 dc into each of next 2 dc, *1 ch, 1 tr into first sc, 1 ch, 1 tr into next sc, 1 ch, 1 dc into each of next 3 dc; repeat from * to end. Turn. Repeat rows (1-4) 17 times, making 18 cube sections total. Fasten off, leaving a long tail end. 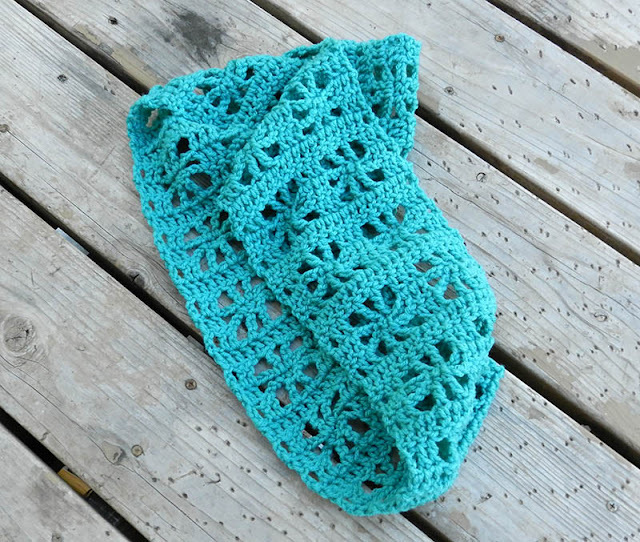 Using your yarn needle and the long tail end, stitch the two ends together with a whip stitch. Thanks! I was thinking of using this for a headband too- I'll let you know if I do! Its beautiful! I love the colour and the pattern! Thanks so much Sian! I will check it out! Hi Elise I just tried starting your pattern however the first step says chain 19 and the second says dc in the 4th ch from hook and all the way across for 19 dc total. However if I dc in the 4th chain I end up with 17 dc in my row. Is this correct? Or am I doing something wrong? Sorry you are having trouble. The beginning chain is 21. You start the first dc in the 4th chain from your hook (this part counts as a dc) and then dc in each ch across. You should end up with 19 dc this way. Good luck to you and let me know if you have any more trouble with my pattern! wow!! this looks amazing! I love this! pinned it and I'm sharing on my FB page later today! Thanks Emily! I appreciate the publicity! Oh, so pretty! I love the detail! This is an adorable scarf. I think I need one...pinned! This scarf is beautiful! I love the airy feel to it and the color is great! Thanks for sharing! This scarf is beautiful! I am making one right now. Did you twist the scarf before connecting the ends? DO YOU HAVE A YOUTUBE TUTORIAL? Sadly... no. I've never done a crochet video before. Good luck! I also would love a you tube video. Visual learner and that really helps. Making three sets of this for teacher end of the school year gifts. I'll post them on Ravelry when I'm done so you can see them! Great pattern! What a good idea! I'll look forward to seeing your pictures on Ravelry! Would you be willing to give written instructions a try? It takes a while to get the hang of it, kind of like learning a new language, but it's worth the effort! How many yards of yarn is required? I didn't keep track of exactly how much yarn I used, but I would guess around 150 yds. I keep getting stuck at this instruction in row 3. What exactly do you mean? Which single crochet am I supposed to be putting the triple into? I can see from the photo that it's meant to connect in the center with the two triple crochets from the previous row, but the instructions are unclear as to how one gets to that point. Any help is appreciated! In row 2 you should have put 1 sc into the top of each tc from row 1. For row 3, those sc are where you are placing the tc. Hope this helps! I think this would make a lovely shawl. I would use it if I were smart enough to figure out how to alter the pattern for that purpose. Can you help, please?